The 9U San Marcos Coyotes Baseball Club representing San Marcos Youth Baseball were crowned champions of the AAU Labor Day Summer Championships in Temecula at Birdsall Park. The three day tournament concluded with wins over two Orange County teams to claim the hardware. Pictured L to R front row: Josh Papazis, Mason Sparks, Cade Seymour, Zach Anderson, Joey Lena, Alec Holmes. 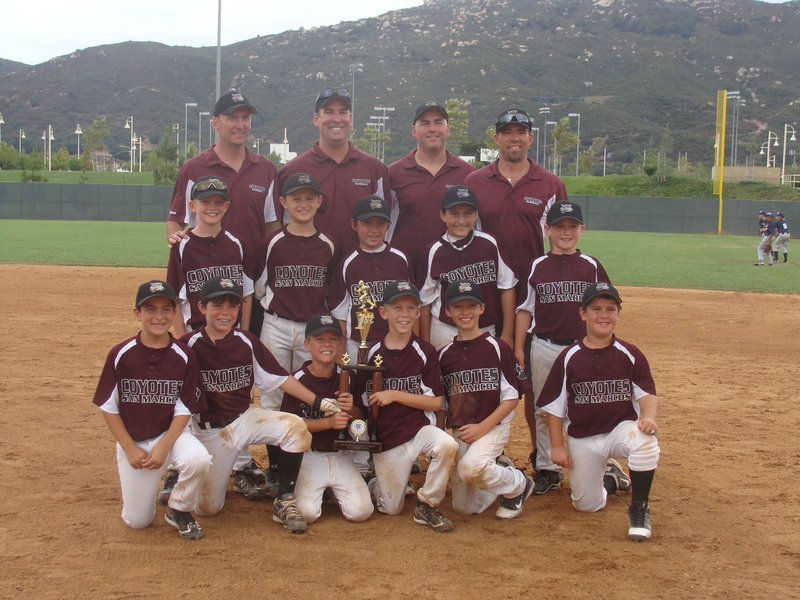 Middle row: Will Corbin, Nathan Barraza, Ryan Dulski, Matt Souza, Cole Kenny. Back row: coaches Mitch Anderson, Dave Seymour, Mike Lena, Josh Sparks. This is the Coyotes 3rd Tournament win in a row!! !